MINI Life in Charleston: Snow in Charleston! So I awoke this morning to a winter wonderland! Today is the first day it has snowed in Charleston in about four years! Perhaps we will have a white Christmas this year . . . I tried to shoot some video; it's not the greatest quality, and the snow looks more like rain, but you get the idea. I just found your blog from a comment you posted on MurMINI's blog...! I love reading about how you work at MINI in SC... 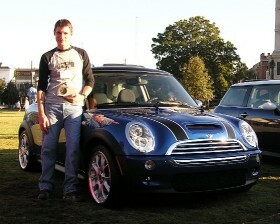 I work at MINI in Ontario, Canada! All the best, happy motoring! !